Ms. Swannie Mae Avery, age 85 of Smithfield, NC transitioned peacefully on Wednesday August 8, 2018 while a resident at SECU Hospice House Smithfield. She leaves to cherish her memories one daughter; Rosa Avery Edwards, two brothers; Offie Avery, Hubert Avery, three grandchildren; Brandon Edwards, Latisha Edwards Richardson, Ralph Lee Edwards II (Candis), four great-grandchildren; Kwamane Woodard, Destany Edwards, Anaya Richardson, Aynsley Edwards, a host of other relatives and friends. 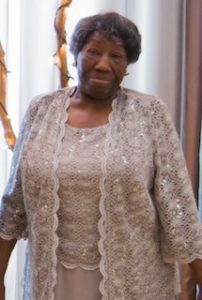 Services for Ms. Swannie Mae Avery are scheduled for Monday August 13, 2018 at Mitchener Memorial Missionary Baptist Church 911 Blount St Smithfield. Viewing/visitation starts at 12 noon followed by Funeral services at 1:00pm. Arrangements handled by Walter Sanders Funeral & Cremation Services, Smithfield.